Israeli sources revealed on Sunday that the Israel Defence Forces (IDF) has deployed more Iron Dome defence systems in the Jewish settlements near the Gaza Strip, fearing an escalation of violence, Quds Press has reported. Senior army officers have announced the IDF’s readiness for any potential escalation on the Gaza front. This might include rockets being launched from the beleaguered territory as Palestinians prepare for more right of return demonstrations in the days and weeks ahead. In what some observers are suggesting is scaremongering, the IDF is also going to check the border fence in Gaza in case explosives have been planted during the demonstrations. 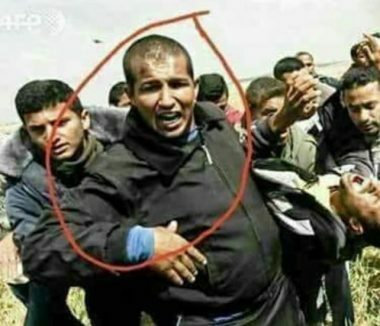 One critic of the Israeli operation said that he would not be surprised if a false flag operation “discovered” or even blew up some explosives to give the Israelis some justification for their brutal response to Friday’s peaceful Great March of Return, in which 16 Palestinians were shot and killed, and hundreds more were wounded, including women and children. Meanwhile, Yedioth Ahronoth reported Israeli security fears of revenge attacks by Palestinians after the “Bloody Friday” incidents. The newspaper reported that Israeli officials expect Hamas to allow other Palestinian factions to launch rockets or plant explosives near the border. On Sunday evening, the Hamas military wing, Al-Qassam Brigades, published pictures of Israeli soldiers spread along the border with Gaza, saying that they were within its firing range. 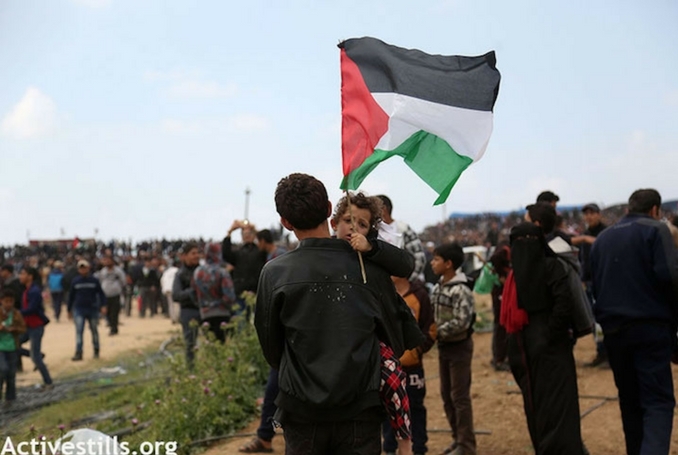 However, it maintained the peaceful nature of the protest despite the violence of the Israeli response, lending even more credence to the possibility of an Israeli-led false flag operation. Israel’s occupation authorities prevented the call to prayer being made at Hebron’s Ibrahimi Mosque at least 52 times in March, a Palestinian Authority official said on Sunday. Religious Endowments Minister Yousef Edees pointed out that the Israelis blocked the adhaan on the pretext of reducing noise affecting the illegal Jewish settlers living in the occupied city. He accused the Israeli occupation forces of “blackmailing” Palestinians at the gates and military checkpoints leading to Hebron’s Old City and Ibrahimi Mosque. He called upon worshippers to spend as much time as possible in the mosque in order to undermine the Israeli occupation’s nefarious plans. The commemoration ceremony was attended by dozens of the Muslim Brotherhood leaders from around the world, including Ibrahim Mounir, the group’s deputy leader, the former head of the Hamas political bureau, Khaled Mashal, in addition to thousands of the group members from various Arabic countries. Since its inception on 22 March 1928, many of the Brotherhood members and leaders have been arrested and held in prisons of the Arab rulers, under the pretext that the group is involved in several terrorist attacks that are being carried out around the world. Arab regimes, such as Egypt, Saudi Arabia and the United Arab Emirates, have named the Islamist group as “terrorist group.” Many of the group’s members and leaders under a travel ban. The Brotherhood has a presence in 52 Arabic, European, Asian and African countries. It also has presence in North and South America and Australia, according to historical and organisational sources. 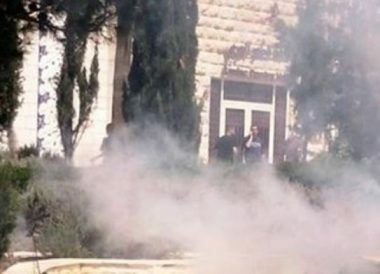 Israeli soldiers injured, Sunday, 98 Palestinians after the army attacked protesters in front of the Al-Quds University, in Abu Dis, east of occupied Jerusalem; two of the wounded were shot in the head, and one in the chest. The Palestinian Red Crescent Society (PRC) said its medics provided treatment to 87 Palestinians who suffered the effects of teargas inhalation, and five who suffered burns from Israeli gas bombs and concussion grenades and moved four of them to a nearby hospital. It added that another Palestinian was shot with a rubber-coated steel bullet, which struck him above one of his eyes, causing a moderate injury. 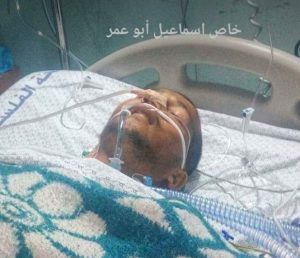 Another Palestinian was shot with a rubber-coated steel bullet which penetrated his chest, causing a moderate injury, before he was rushed to Palestine Medical Complex in Ramallah. On Sunday evening, the soldiers installed a military roadblock, and abducted a young man, in addition to confiscating his motorcycle, near Sielet al-Harithiyya town, west of the northern West Bank city of Jenin. The soldiers also installed a military roadblock at Kafr Dan village junction, near Jenin, stopped and searched dozens of cars and interrogated many Palestinians while inspecting their ID cards. 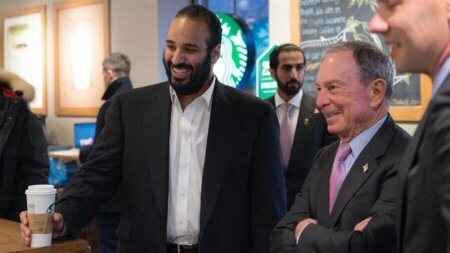 Mohammed bin Salman, the crown prince of Saudi Arabia, has met with leaders from a number of right-wing Jewish organizations during his tour of the United States. Haaretz reported that, according to a leaked copy of his itinerary, Bin Salman also met with leaders from the Conference of Presidents, B’nai B’rith and the American Jewish Committee (AJC). While Saudi Arabia does not officially recognize Israel, analysts have repeatedly said that the overtures by Bin Salman signal a warming of ties between the two countries. “There was an old understanding from Arab leaders that the gates for Washington, DC are guarded by pro-Israeli leaders. This includes business leaders, groups such as AIPAC and others linked to Israel,” Zweiri told Al Jazeera. “[Bin Salman] is following that trend, he’s trying to court the US and show them that he supports their plan for Israel-Palestine and their decision to move the US embassy to Jerusalem. “Another dimension is that when Republicans are in power, it’s widely believed they have closer ties to Israel and the Israeli agenda. As part of his two-week tour, the crown prince has already met Bill and Hillary Clinton, Senator Chuck Schumer, UN Secretary-General Antonio Guterres, former Secretary of State Henry Kissinger, and former New York Mayor Michael Bloomberg. Other notable media meetings include dinner with Rupert Murdoch, CIA director and soon to be Secretary of State Mike Pompeo, Vice President Mike Pence, Defence Secretary James Mattis and Trump’s senior adviser and son-in-law, Jared Kushner. It would be nice to think that, as an Israeli officer once put it, “This time we went too far” — that the killings of 17 unarmed protesters in Gaza by Israeli riflers across a security fence on Friday would cause the world to sanction Israel for its conduct. But if you look over Israel’s history, you find that the massacre has been a ready tool in the Israeli war-chest; and Israelis have not been prosecuted for carrying them out. Indeed, a couple of those responsible later became prime minister! 1946. Zionist militias blow up the south wing of the King David Hotel, killing 91 people, most of them civilians, in order to protest British rule of Palestine. 1948. Zionist militias kill over 100 civilians in the village of Deir Yassin, which is on the road to Jerusalem. The action helps clear the road for the military advance on Jerusalem and scares thousands of other Palestinians who flee their villages. The name Deir Yassin becomes a rallying cry for Palestinians for decades to come though no one is punished. An officer with responsibility for the massacre, Menachem Begin, became Israeli prime minister 29 years later. 1948. During the expulsion of Palestinians from the central Israeli city of Lydda, more than 100 men are rounded up and held in a mosque and later massacred (according to Reja-e Busailah’s new book and others). The episode terrifies thousands of other Palestinians who seek refuge in the West Bank. 1948. Hundreds of Palestinian civilians are killed by Israeli forces in Al Dawayima village, west of Hebron. Many are killed in barbarous manner; the crime is swept under the rug for decades. 1956. Israeli forces gun down farmers in Kfar Qasim returning from the fields who are unaware that the village had been placed under a strict curfew by the Israeli government earlier that day. 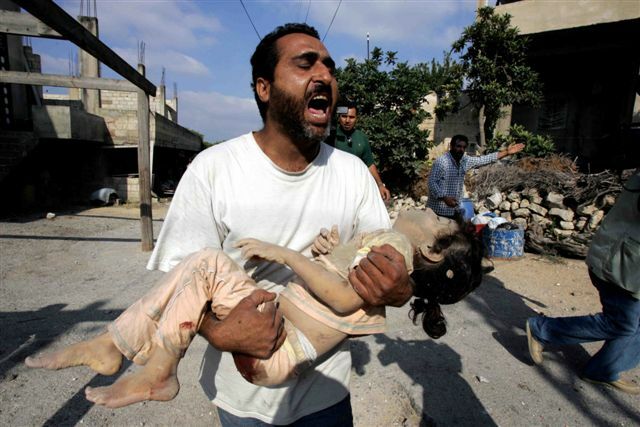 Forty-eight Palestinian citizens of Israel are killed, many women and children. 1956. Israeli forces kill 275 Palestinians in Gaza in the midst of the Suez Crisis. The massacre is documented by Joe Sacco in Footnotes in Gaza. 1967. Israeli forces are said to have killed scores of Egyptian army prisoners in the Sinai during the 1967 War. Some say 100s. 1970. Israel killed 46 Egyptian children and wounded 50 others during an air raid on a primary school in the village of Bahr el-Baqar, Egypt. Known as the Bahr el-Baqar Massacre, the assault completely destroyed the school and was part of the Priha (Blossoms) Operations during the War of Attrition. 1982. The Sabra and Shatilla massacres of Palestinians in Beirut refugee camps are carried out by Lebanese Phalangist militias. But the Israel Defense Forces had control of the area and Ariel Sharon allows the militias to go into the camps. Somewhere between several hundred and 3000 Palestinians are murdered. Sharon, who died in 2014, escaped punishment for war crimes; in fact, he became an Israeli prime minister. 1996. The first Qana massacre takes place when Israeli missiles strike a UN compound in southern Lebanon where many civilians have gathered seeking refuge during clashes between Israel and Hezbollah. Over 100 civilians are killed. “Israel was universally condemned, and the United States intervened to extricate its ally from the quagmire,” Avi Shlaim writes in The Iron Wall. 2006. The second Qana massacre takes place during the Lebanon war when Israeli missiles strike a building in a village outside Qana, killing 36 civilians, including 16 children. The strike is initially defended as a response to the firing of Katyusha rockets at Israel from civilian areas. 2008-2009. During Cast Lead, the Israeli assault on Gaza following exchanges of rocket/missile attacks in months before, more than 1400 Palestinians are killed over 22 days, most of them civilians. Many die as at Qana, when they flee their homes to UN compounds and schools, hoping to be safe. The massacre brings international condemnation, including by the Goldstone Report to the UN Human Rights Council alleging war crimes; but the United States does its utmost under President Obama to defend Israel from all charges, and no one is brought to the bar. 2012. During eight days of “Pillar of Clouds,” Israel kills 160 Palestinians in Gaza, most of them civilians. The offensive boosts Netanyahu in the polls and seems timed to torpedo Palestine’s historic UN bid for statehood. 2014. Another Israeli onslaught on Gaza, this one lasting 51 days, kills upwards of 2200 Palestinians, most of them civilians. The massacre is famous for sniper killings of unarmed people and for the killings of entire families, 89 according to some authorities, typically wiped out in their homes by a missile strike. In one instance, 20 members of one family are killed. The international condemnation is again toothless. You can justify what’s happening now to Palestinians in Gaza only if you can justify our Nakba – the violent establishment of a Jewish state in Palestine in 1948 against the will of Palestinian non-Jewish Arabs, the vast majority at the time. They should be calling for the end of Israel’s Zionist Apartheid regime, i.e., the end of the Jewish state that is now in control of the whole territory, and all borders of historic Palestine and call for one secular democratic state. They should be questioning why it is that when Jews immigrate to historic Palestine, they are said to be emigrating from the “diaspora” to the “Land of Israel” by law, while Palestinian Arabs (Muslims and Christians alike), refugees and exiles seeking return to their lands and property as specified by Res194, are said to be a “security threat” or a “demographic threat” in their own homeland. Palestinians are gunned down even when they attempt to return only symbolically. Following the establishment of Israel, Prime Minister David Ben Gurion issued a shoot-to-kill order against any returning Palestinian Arab, most of whom were desperate civilians seeking to recover their crops, property, or homes. He should be saying, instead, there can be no justification for our Nakba. The fact that Israel’s response to Palestinian resistance is the same, no matter what form of protest they make, is a clear indication that the very existence of Palestinians on this earth is Israel’s problem. Seventy years after our Nakba, the US blocks a Security Council statement condemning Israel’s massacre of protestors at the border. Palestinians, who are no match to Israel’s military power now bolstered by $3.8 billion annually in U.S. aid, have only the strength of the justice of their cause.